The RP Photonics Buyer's Guide contains 23 suppliers for thin-film polarizers. The RP Coating software can be used to design thin-film polarizers; see a demo case. Thin-film polarizers are a kind of optical polarizers based on interference effects in a multilayer dielectric coating. That coating is usually placed on a glass plate. (A birefringent optical material as in various other types of polarizers is not needed.) A strongly polarization-dependent reflectivity is achieved for some range of incidence angles. (Basically always, s-polarized light is reflected and p-polarized light transmitted.) It is often convenient to design a thin-film polarizer such that it can be operated with an incidence angle of 45°, such that the reflected beam is obtained with an angular change of 90°. Plate polarizers (Figure 1) consist only of a coated glass plate. The design is often made such that the angle of incidence is essential at Brewster's angle. In that way, reflection losses for the transmitted light on the back side are avoided easily. For other angles of incidence such as 45° (which is often convenient), an anti-reflection coating is required on the back side, and the layer structure design for the front side can also be more difficult. Figure 1: A plate polarizer for operation near Brewster's angle, having a reflecting coating on the top side and no coating on the bottom side. There are also polarizing cubes (Figure 2), which are obtained by coating a 45° prism and cementing another 45° prism to it, so that a cube is obtained. The input and output faces usually obtain anti-reflection coatings. The basic idea of the common MacNeille cube design  is to eliminate the reflection for p polarization by having Brewster's angle at all internal interfaces. It is then easy to obtain high reflectivity for s polarization with a simple Bragg mirror design without introducing a significant reflection for p polarization. The Brewster angle condition requires that a substrate material with suitable refractive index (for given coating materials) is chosen. Such designs work well in a large range of wavelengths, but only in a narrow angular range (typically a few degrees). In other polarizing cube designs than the MacNeille design, one does not fulfill the Brewster angle condition but uses interference effects to suppress reflection for p polarization. Such interference polarizers typically operate well only in narrow wavelength ranges but give more flexibility concerning the used materials. The cemented interface of a polarizing cube leads to a lower optical damage threshold of the order of 1 J/cm2 for nanosecond laser pulses. Optically contacted epoxy-free polarizing cubes, not requiring a cement, can stand several times higher fluences. Figure 2: A polarizing cube based on a thin-film coating between two 45° prisms. Since the interference effects in the multilayer coating are wavelength-dependent, a thin-film polarizer can work only in a limited wavelength range and angular range. However, operation in a range of tens or even a few hundred nanometers is possible by proper optimization of the thin film design. 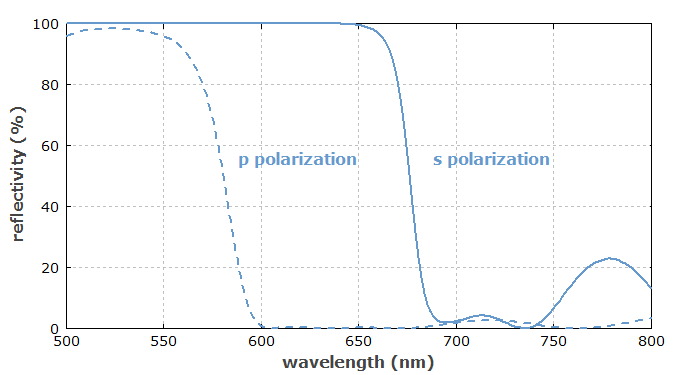 Such broadband polarizers, however, do not achieve the very high performance of narrowband polarizers (laser line polarizers), which are optimized for a narrow wavelength range. Figure 3 shows an example with a moderate operation bandwidth of 50 nm. Figure 3: Reflectivities of a thin-film polarizer cube based on TiO2/SiO2, designed for operation at 600–650 nm with the software RP Coating. For the optimization of the coatings for thin-film polarizers, similar numerical techniques can be used as for designing broadband beam splitters or dichroic mirrors, for example. An advantage of thin-film polarizers is that they can be made with rather large dimensions, which is more difficult with crystalline (birefringent) polarizers. It is thus possible to operate such high-power or high-energy devices with laser pulses at very high peak power levels.